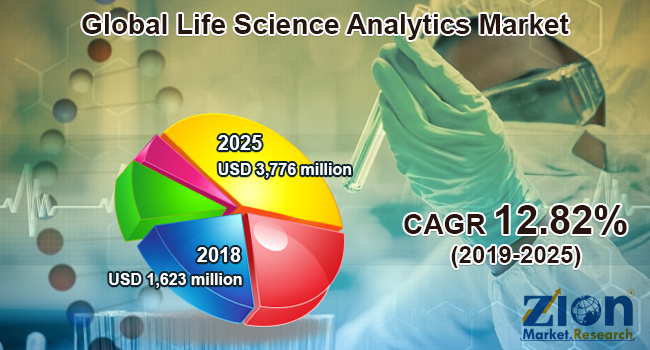 Global life science analytics market expected to generate around USD 3,776 million by 2025, at a CAGR of around 12.82% between 2018 and 2025. Increasing healthcare costs to boost the demand for life science analytics would streamline the third-party processes and optimize the overall costs. The report covers a forecast and an analysis of the life science analytics market on a global and regional level. The study provides historical data of 2016, 2017, and 2018 along with a forecast from 2019to 2025 based on revenue (USD Million). The study includes drivers and restraints of the life science analytics market along with their impact on the demand over the forecast period. Additionally, the report includes the study of opportunities available in the life science analytics market on a global level. In order to give the users of this report a comprehensive view of the life science analytics market, we have included a competitive landscape and an analysis of Porter’s Five Forces model for the market. The study encompasses a market attractiveness analysis, wherein all the segments are benchmarked based on their market size, growth rate, and general attractiveness. The study provides a decisive view of the life science analytics market based on type, component, delivery mode, application, end-user, and region. All the segments have been analyzed based on present and future trends and the market is estimated from 2019 to 2025. The type segment includes descriptive, predictive, and prescriptive. The component segment includes software and services. By delivery mode, the market is segmented into on-premises and on-demand. The application segment includes clinical and preclinical trials, research and development, regulatory compliance, sales and marketing, supply chain management, and pharmacovigilance. The end-user segment includes pharmaceutical and biotechnology companies, medical device companies, biomedical research centers, and third-party administrators. The regional segment includes the current and forecast demand for North America, Europe, Asia Pacific, Latin America, and the Middle East and Africa. Some key players of the global life science analytics market are TAKE Solutions, Accenture, SAS Institute Inc Oracle Corporation, Quintiles, Inc., Cognizant, IBM Corporation, Wipro Limited, MaxisIT, Inc., and SCIO Health Analytics, among others.